Aston Bali Resort and Spa, a four-star hotel with five-star qualities, located in Tanjung Benoa, where the legendary charms can still be savored. Bali's architectural heritage and natural beauty, has an individual distinction, as well as a unique sense of destination, for visitors wanting comfort, amidst native settings, strictly for pleasure. 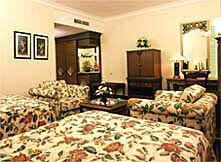 There are 187 rooms including 19 suites strictly for pleasure. Regarded as a dream, rather than a place, Aston Bali Resort and Spa, has a special charm that stimulates the sixth sense, the sense of pleasure. Satisfied, fulfilled, pampered, relaxed. One finds time again and again in this place, to discover and rediscover the senses of pleasure and memories that will make you ask yourself why you have ever left a place that is strictly for pleasure. All rooms has individual controlled AC, color television, Parabola, in room mini bar, coffee & tea making facilities, private balcony and IDD telephone. The sunlight will take you to various activities under the clear Balinese sky. Your view of the sea and exotic gardens begins here. Sand, hibiscus, frangipani and banana leaf green, are colors of choice. Stroll down our sun drenched white sandy beach or just sit back and relax in our swimming pool or in Cafe Melasti, watch the local fishermen bring in the days catch from the deep blue waters of the Indian Ocean. Night time in Bali is a feast for eyes as the magic of Bali Legong Dance and other traditional dancer explode in cornucopia of valor at Samudra Lounge or at Casablanca Lounge Piano Bar, enjoy the jazzy of live musicians.